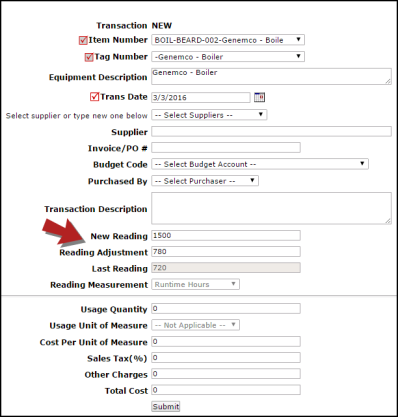 You can enter readings for your equipment to keep track of your equipment usage and even create PM Schedules based on those reading measurements. In Work Order, click the Add link in the Actions menu and click on Equipment Usage. Select either the Item Number or the Tag Number for the piece of equipment. The Transaction Date for the reading will populate with today's date. Enter any applicable information on the Equipment as necessary. If you are tracking runtime hours, mileage, etc., enter the New Reading in the field. The Reading Adjustment will calculate based on the Last Reading. Reading Measurement will populate with the selection you made when you entered that piece of equipment. *Note: In order for the Reading Measurement unit (Runtime Hours, Miles, etc.) to be populated on this form, you must select it on the Add/Update Equipment form. If you need to track equipment consumption, you can also track that usage in the Usage Quantity field. Click Submit to save the Equipment Usage Transaction. You will see a list of usage transactions for this equipment at the bottom of the page. You can keep track of your equipment usage in Work Order through both the Advanced Search and the Equipment Usage Report. Hover over the Shortcuts menu and select Equipment Usage Search. Select your search criteria and click Search Now. This search can also be saved as a Saved Action by clicking Save and Search Now. You can print this list of Equipment Usage Reading to PDF or Excel. Click on the Report link in the Actions menu and select Equipment Usage. Select your report criteria in Steps 1 through 11. In Step 12, you can select to see the Equipment Costs (fuel consumption, etc.) or Work Order Costs (labor and material transactions entered on work orders for this piece of equipment). In Step 13, select either the Summary Report or Detail Report. Choose to print the report to PDF or Excel and click Print This. In Planned Maintenance, you can set the PM frequency based on the Equipment Reading Measurements. For example, you need to change the oil in your vehicle every 3000 miles. *Note: In order for the PM work order to generate accurately, you must be diligent about entering the equipment usage transactions on a regular basis. In Step 7 on the PM Schedule form, you must select only one piece of Equipment. In Step 16, select Reading Frequency as the Recurrence Pattern. *Note: If you decide to select Recurring Calendar Event or Reading Frequency the system will generate the work order on whichever one comes due first. Check the Generate next PMWO after current PMWO completed date box to reset the frequency counter to the completion date of the previous work order generated from this schedule. For example, a work order to change the oil in a truck was generated on June 1st. The oil change was performed on June 15th and the work order was marked complete on that date. If this box is checked, the system will restart the reading frequency counter on June 15th, the day that the oil change actually occurred. If it is left unchecked, the system will restart the reading frequency counter on June 1st. This setting will override the Yes, create a new PM WO even when there is a work order in-process, not completed/closed setting on the Generate PM's On page for this individual PM schedule. This schedule will never create a new work order when the previous work order is still open.